Dr. Michio Kaku, the well-known theoretical physicist, stated in an interview a few years back that becoming invisible would soon be a reality. An object is perceivable because it deflects light particles traveling towards our eyes. If a ray of light is allowed to bend around the object and move on, the object can become invisible. Scientists at Duke University have successfully conducted experiments to build technology that can bend light. 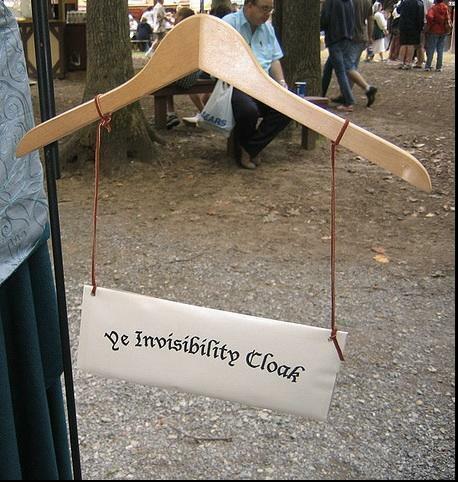 With the help of this technology, the first invisible cloak has been made. It was launched a few days ago in the World Science Forum in Manila. To demonstrate the invisibility feature of the cloak, organizers invited participants from public and the candidate for demonstration was chosen at random. ... was thrilled when his name was announced for the demonstration of the cloak. He was called on to the stage and a cordless microphone was fixed to his collar so that he could be heard though not seen. The organizers switched off all lights on the stage. ... was then covered from head to toe with the invisibility cloak, which was actually a tight-fitting suit with holes for breathing and seeing. The suit initially made him anxious but he soon became comfortable with it. The lights were turned on. Lo and behold, ... turned completely invisible. He could not be seen on the stage but his voice could be heard clear across the auditorium. ... then responded to some casual questions. The audience was seeing (or rather not seeing) something truly fantastic. The scientists who made the cloak were promptly congratulated by all dignitaries including the President of Philippines who attended the event. Everyone was shaking hands with everyone else on the stage, celebrating the successful launch of the scientific breakthrough. The stage became a little disorganized in the process. In that mild commotion, no one realized that ..., who was wearing the invisibility cloak for demonstration, had actually vanished with the suit. Only when someone called out for ... and there was no response did people realize that ... had actually vanished from the stage. The organizers went into a frenzy as they did not know how to locate the invisible .... Some people waved their hands around wildly to see if they might knock into him. Several anxious minutes passed. Suddenly, ...’s voice was heard when he said, "I am here" from a distance. Peopled turned and looked in the direction of the sound, to see if they could see him there. Then he spoke from another spot. Then from another. After giving the organizers a harrowing runaround for 30 minutes, he came on to the stage and allowed himself to be located. Though his antics had tormented the organizers to no end, his ability to hide in plain sight act only proved the efficacy of the cloak. No one said anything to him. He allowed organizers to remove the suit and walked away content, having experienced the disappearing act of a lifetime.